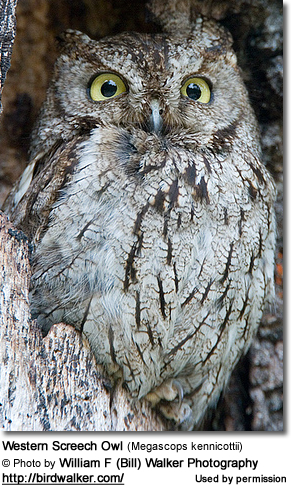 The Western Screech Owls (Megascops kennicottii) are small owls that are found in western United States, Canada and Mexico. They are relatively common and resident (non-migratory) throughout their large range. 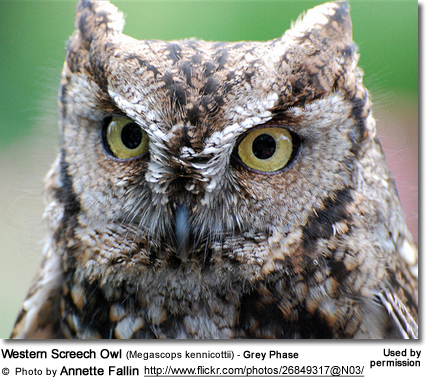 They were previously considered conspecific (one and the same species) with the Eastern Screech Owl. 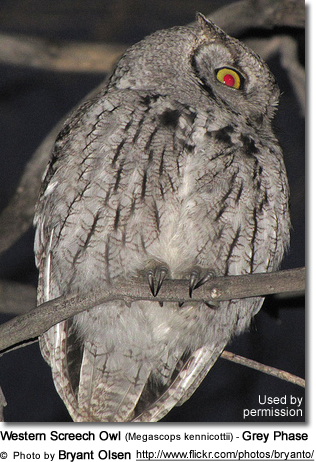 These nocturnal birds become active after sunset and silently hunt their prey at night. They occur in red, grey and intermediate phases; with grey being the most common. These birds are also locally known by myriad names that were derived from their loud and occasional screeching calls, their physical description or mystical associations (superstitions). These birds are found in western North America ranging as far north as southern Canada and southeastern Alaska south through the coastal regions of the Pacific Northwest to the Baja penninsula and into Mexico. 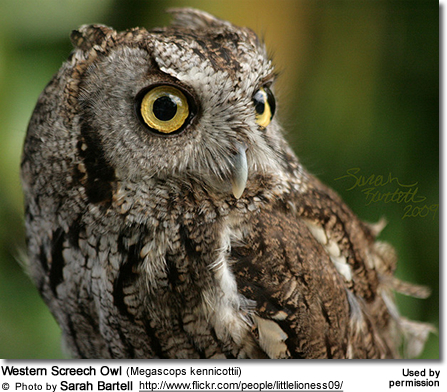 In the United States, their range has expanded in the last decades to go as far as eastern Colorado and Texas, where their range now overlap with its close relative - the Eastern Screech Owl. They are typically found in red cedar, hemlock and Douglas fir forests, as well as inhabiting Sitka spruce forests. They generally remain near bodies of water and riparian woodlands. They are also commonly found in residential areas, orchards, parks and cemeteries with shade trees. 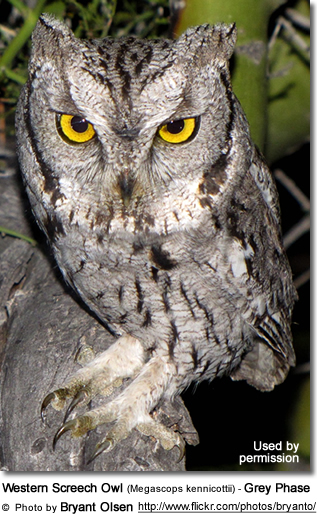 They typically avoid areas that are hunting grounds for the larger owls (particularly the Great Horned Owl). During the day, these owls roost in natural cavities of large dead or living trees, in buildings or in the dense scrubby brush or foliage. 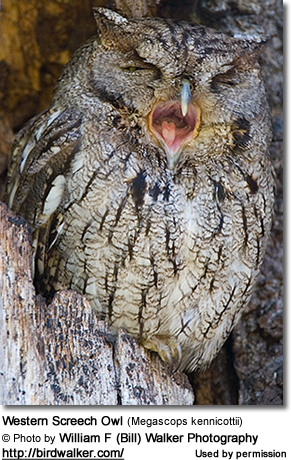 Western Screech Owls are compact in size and shape, measuring from 6.3 - 9.8 inches (16 - 25 cm) in length, including the short tail, and weighing about 4.3 - 8.6 oz (121 - 244 grams). The females tend to be larger - with an average length of 9.2 inches (23 cm), a wingspan of 22 inches (56 cm) and weight of 7.3 oz (208 g). The smaller males average 8.2 inches (21 cm) in length, have a wingspan of about 21 inches (54 cm) and weigh about 7 oz (200 g). 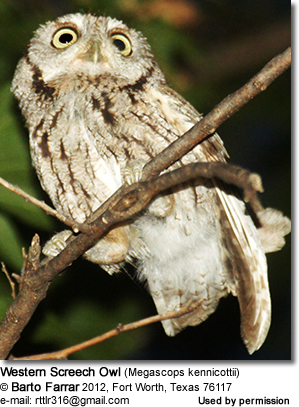 The head is large and round, with prominent, wide-set ear (feather) tufts. The eyes range in color from greyish-yellow to bright yellow. The bill ranges from greyish-yellowish / bone color to greyish-green at the tips with tufts of bristly feathers around the base. There are two color morphs: a grey phase and a reddish-brown phase. The two color variants will mate together producing offspring with a brownish grey plumage. The plumage below is whitish patterned with streaks, offering them a perfect camouflage against the tree bark. The adults in both color phases have vertical streaking on the chest and abdomen (horizontal in the juveniles). The reddish-brown variant is more common in the southern part of its range. The vast majority of the Pacific populations (up to 7%) are reddish-brown and the rest are grey. The pale grey variation occurs in western Canada and north-central United States. The facial disk is dusky white with fine grey-brown mottling, bordered by black. The plumage is overall dark grey or grey-brown, with grey narrow vertical stripes, bars and spots on underparts, and barred wings and tail. The facial disk is a paler cinnamon; the upper plumage is rusty colored. Juveniles of both color phases can be identified by the horizontal streaking on the chest / abdomen (vertical in the adult). Many feathers are tipped with white. Juveniles have paler bills - compared to the bills of the adults which are darker, except for lighter tips. Otherwise, juveniles resemble the adults. 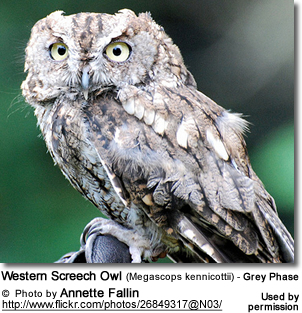 Western Screech-Owls resemble the Eastern Screech Owls; but can be differentiated by the color of the bill. 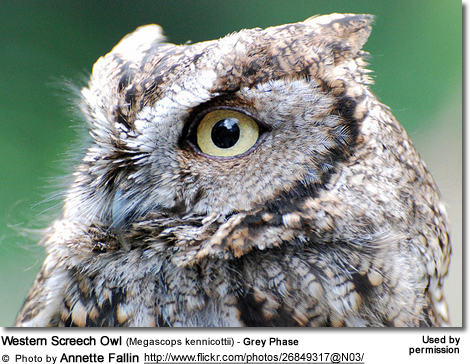 TheWestern Screech Owls have bills that are greyish to black, while the Eastern Screech Owl's bill is greyish-horn colored. 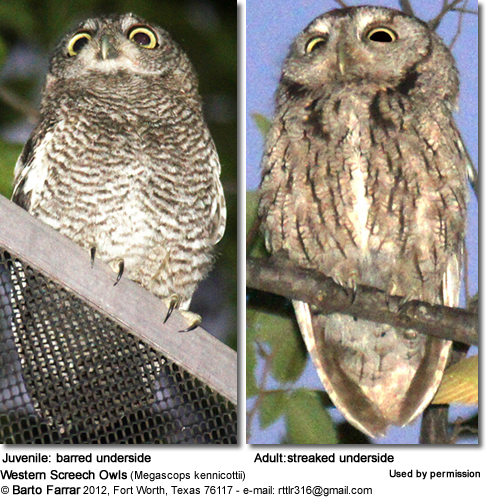 The ranges of these two screech owl species overlap only in eastern Colorado and southern Texas. They eat various larger insects, such as beetles, moths, crickets, grasshoppers and cicadas, which makes up more than half of their diet. They will also hunt small mammals, such as rodents, bats, shrews up to the size of rabbits; and birds ranging from chickadees, sparrows, warblers up to the size of a Ruffed Grouse (which are heavier than the screech owls). On occasion, they will also take earthworms, reptiles (small snakes, lizards even baby soft-shelled turtles), amphibians (frogs, toads, etc.) and small fish. 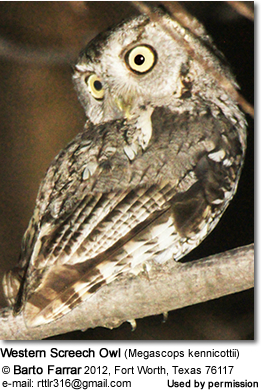 They are active at night or near dusk. Most hunting occurs during the first hours of darkness. Because of their excellent hearing and night vision they are able to locate prey in darkness. They usually watch from a perch and swoop down when prey is detected and capture their prey with their well-developed raptorial claws (talons). They are also able to catch insects or small birds in flight. 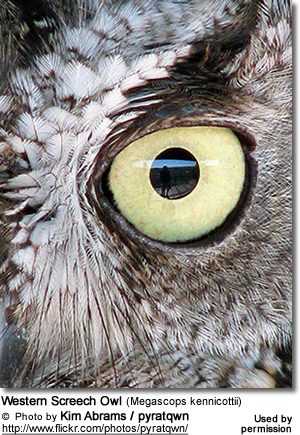 During the winter, these owls have been observed hunting for fish at fishing holes or cracks in ice at bodies of water. Smaller prey is usually swallowed whole on the spot; while larger prey is typically carried to the nests or roosting place where they use their claws and the curved bill to tear the prey into pieces that are small enough for them to swallow. Every day, they expel about 2 - 4 medium-sized, compact, dark grey, oval pellets that are about 1.5 - 0.75 inches (3.8 - 1.9 cm) in diameter. These pellets are composed of indigestible parts of its prey - such as fur, feathers, bones, teeth and chitin. The breeding season usually starts in mid-April - although may commence as early as mid-March - and stretches to mid- May. The males select the nest sites, and the females select their mates based on the quality of the nest site or the amount of food the male placed into the nest. Their elaborate courtship ritual involves males approaching females, calling from different branches until they are close. At this point the males bobs and swivels his head, and then bobs his entire body. Should the female ignore his efforts, intensifies his bobbing and swiveling. She will show her receptiveness by moving closer to him until their bills touch and they start preening each other. Pairs are monogamous, mating for life; however, they will accept a new mate if their previous mate disappears. Males will defend small territories around their nest sites. They typically nest in cavities of deciduous trees, such as oaks and maples. These cavities are typically 6.5 - 20 feet (2 - 6 meters) above the ground, but may be situated as high as 50 feet (15 meters) above the ground. They may use the abandoned nests of other birds, such as woodpeckers. In urban areas, they may also use suitable nest boxes or nest behind loose boards on abandoned buildings or barns. They typically reuse the same nesting site year after year. The average clutch consists of 3 - 4 eggs. The female does most of the incubation (brooding of the eggs) which lasts about 26 days to hatching. The male is responsible for feeding the nesting female. Once the young hatched, the female will tear food up into smaller sizes to feed to the young. Due to nest predation, only one young is likely to survive to fledging, which occurs about 31 days after hatching. They usually only produce one clutch a season; but may produce a second, if the first clutch is lost. 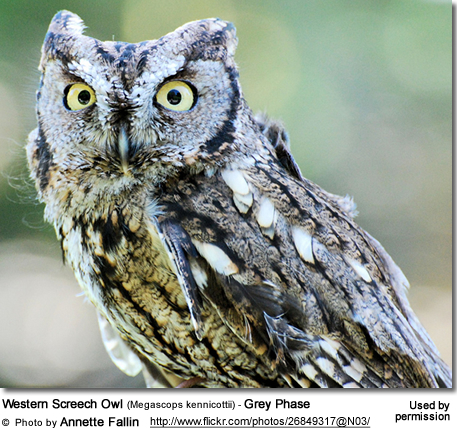 Notwithstanding name, these owls rarely screech; their calls instead are generally a series of short whistles "hoo-hoo-hoo...."at an increasing tempo or a short then long trill while maintaining a constant pitch. They also produce barking and chuckling sounds; a tooting "bouncing ball" song and the occasional high pitched screech. During the day, these owls are rarely seen due to their nocturnal habitats - however, their haunting calls are often indicative of their presence.